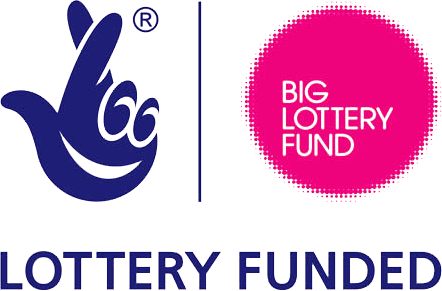 Phase 2 (2012-2015) has evolved from the learning gathered in Phase 1 and the intervention areas are now within natural neighbourhoods and communities have more opportunity to shape the projects that are delivered at a local level. Phase 2 has also begun to explore how the intervention can be scaled-up to reach larger audiences as well as testing the model within a primary care environment. Who participates in Well London activities? Do participants experience improved health and wellbeing? Are projects delivered as planned? Which projects contribute to improved health and wellbeing? Are the priorities of the local community being addressed? Are the priorities of the local commissioners being addressed? Is the overall programme being delivered as planned? The focus was Well London participants and we collected a greater amount of information about their experiences and patterns of participation, and how these influenced outcomes. In addition, information about the potential legacy of the Well London work was collected in a more systematic way. 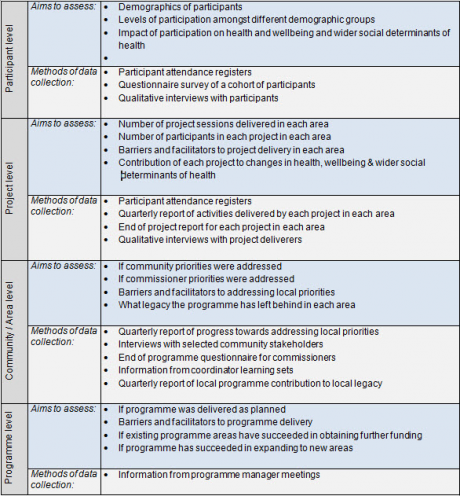 To do so, an evaluation framework was designed to ensure that information at four levels – participant, project, programme and area – was accurately captured.